Not everything accepts black and white as art does. If you liked those clear blues skies in the previous post, notice here how this masterpiece needs not to be reinforced by color. This again is the Passion façade and I post the picture to show the covered spires and the scaffolding that is omnipresent in the new side. Thanks to my friend Bob from Barcelona daily photo for reminding me that not all the towers look so polished, as some of them are covered by some green plastic net. Thanks to Lisi from Hongkong daily photo for asking what the letters on the spires read - "Hosanna in Excelsis. Sanctus, Sanctus, Sanctus" something that is said at the end of Sanctus in Mass. The towers as you know represent the Holy Family. Great low-angle shot, nice sepia processing. 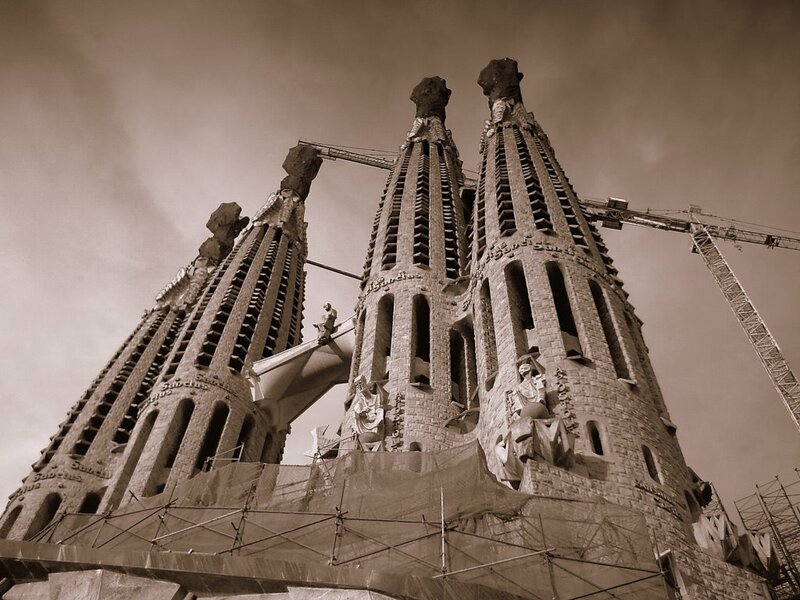 A true beautiful picture of the Sagrada Familla. this is a nice angle too. thank you for recommending KL Daily! >Nicola: Thanks. Glad you see the point. >Lisi: This is what I like most, as the color I can manage after. >Edwin: You are welcome. I will bear in mind Cafe de L'Opera too. Wow!! Great shot Carlos I like the angle.